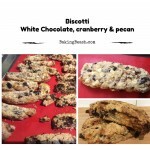 A quick easy recipe for biscotti. 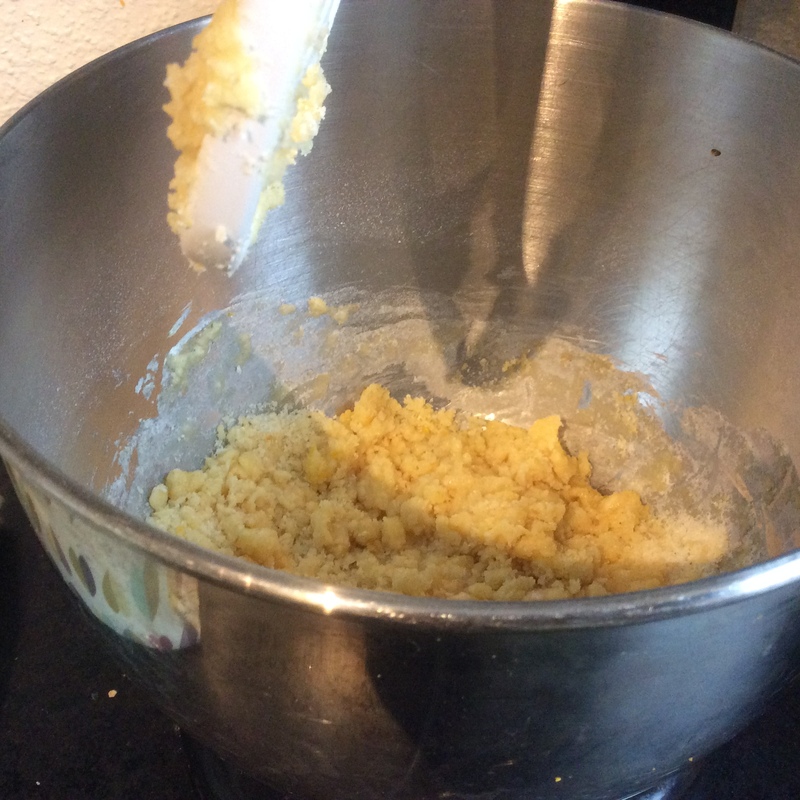 Sieve the flour and baking powder into a bowl. Finely zest your chosen citrus fruit (grate the skin) try not to get any of the white pith and add to the bowl. 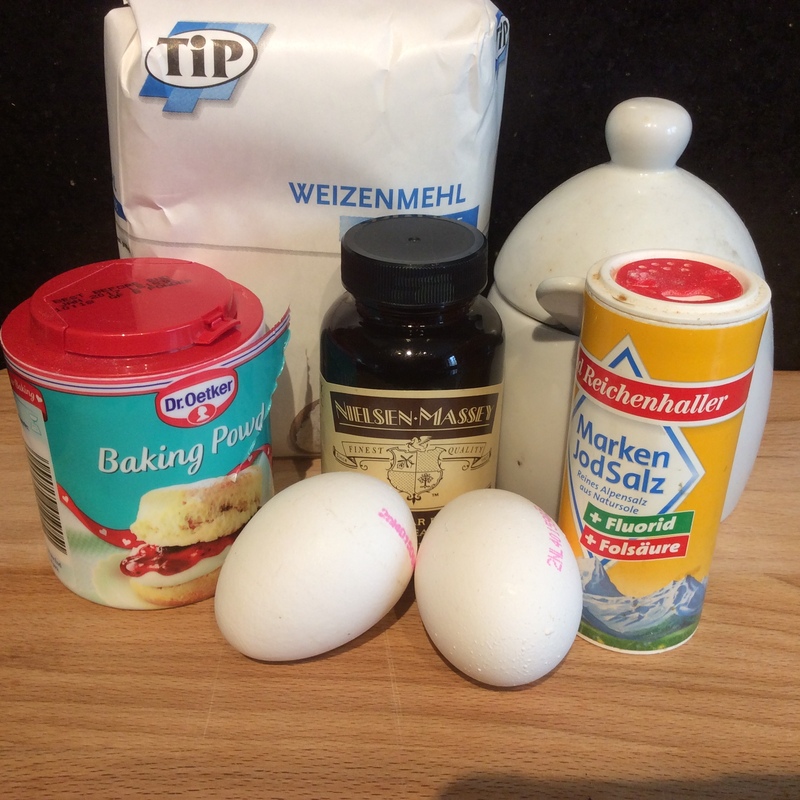 Then add all of the other basic ingredients. Stir gently until just combined. 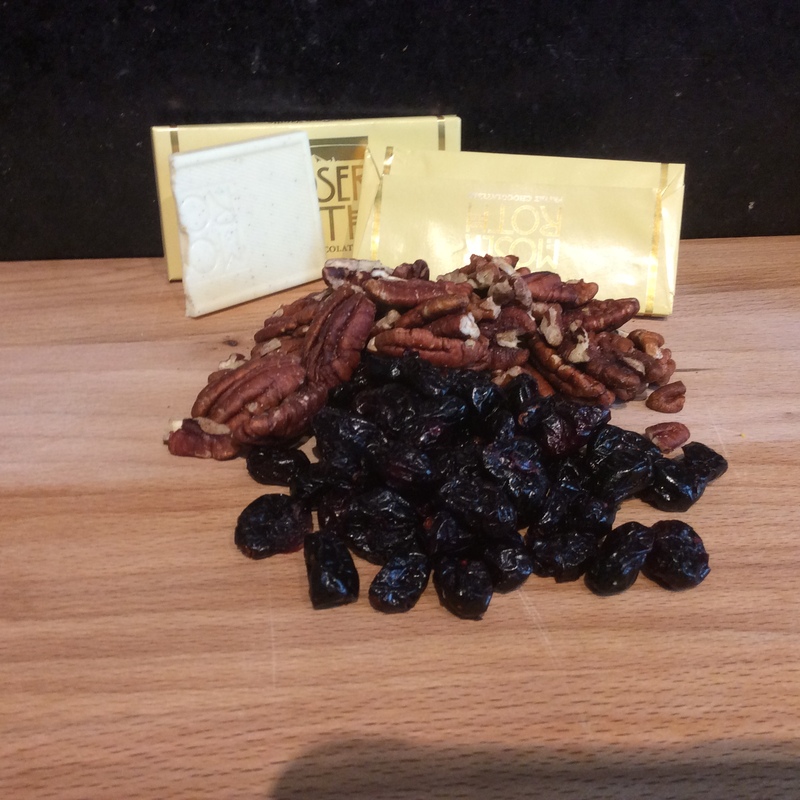 Chop your chocolate into large pieces, chop your nuts into halves. If using dried apricots cut them into 4 or 6. 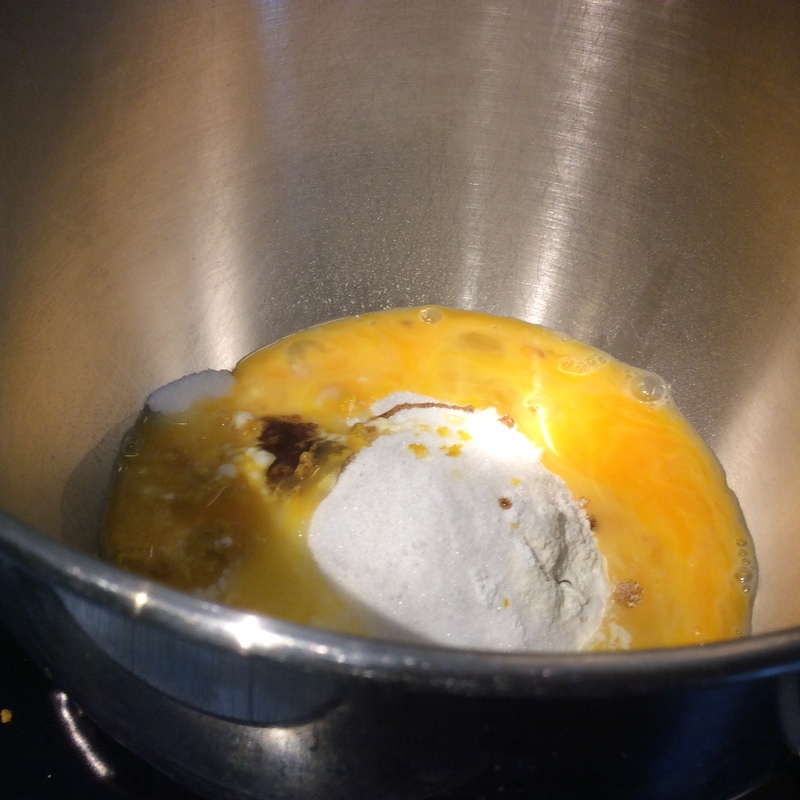 Add this to the other ingredients and mix , until it is well dispersed. Line a baking sheet with a silicon sheet or baking paper. 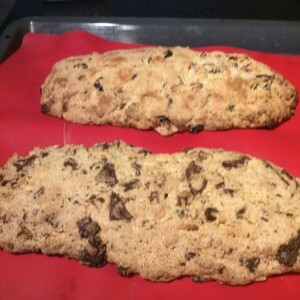 Split the biscotti mixture into 2 and form into 2 long logs. I find this is easier to do with your hands. Place on the baking sheet. Cook for 20 minutes. Then remove and place on a chopping board and using a serrated knife slice into 1 inch, 2.5 cm slices ( see picture below). Return to the oven and cook for 5 to 10 more minutes until the biscuits are reasonably firm. Leave to cool on a wire rack. They do also taste great warm from the oven. Biscotti is one of my favourite biscuits. It is originally from Italy, but now you can get it almost everywhere. 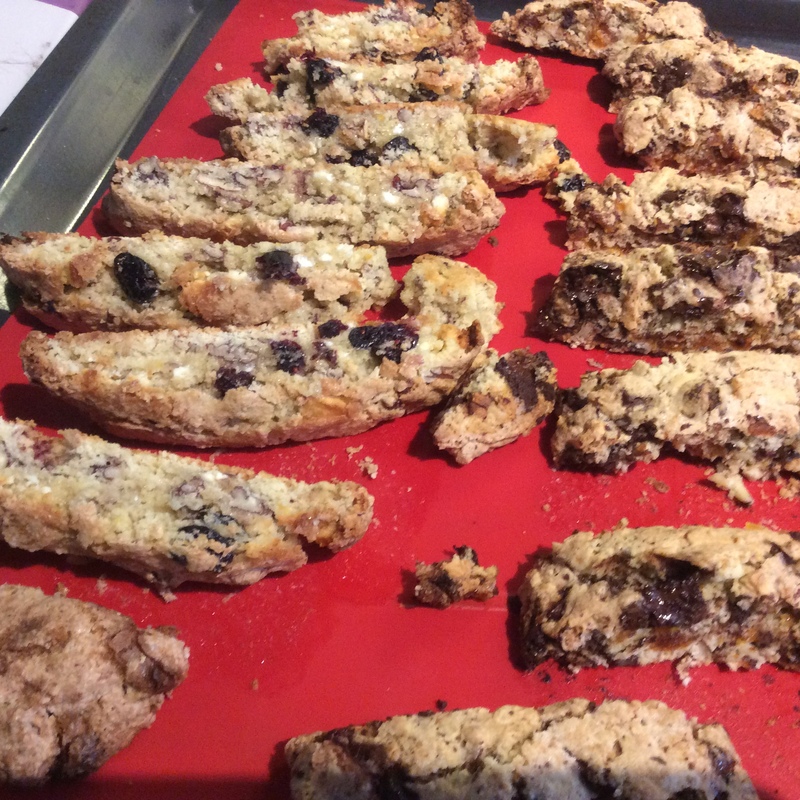 Biscotti is baked twice and is the Italian name for biscuit which in English also originally related to twice baked. 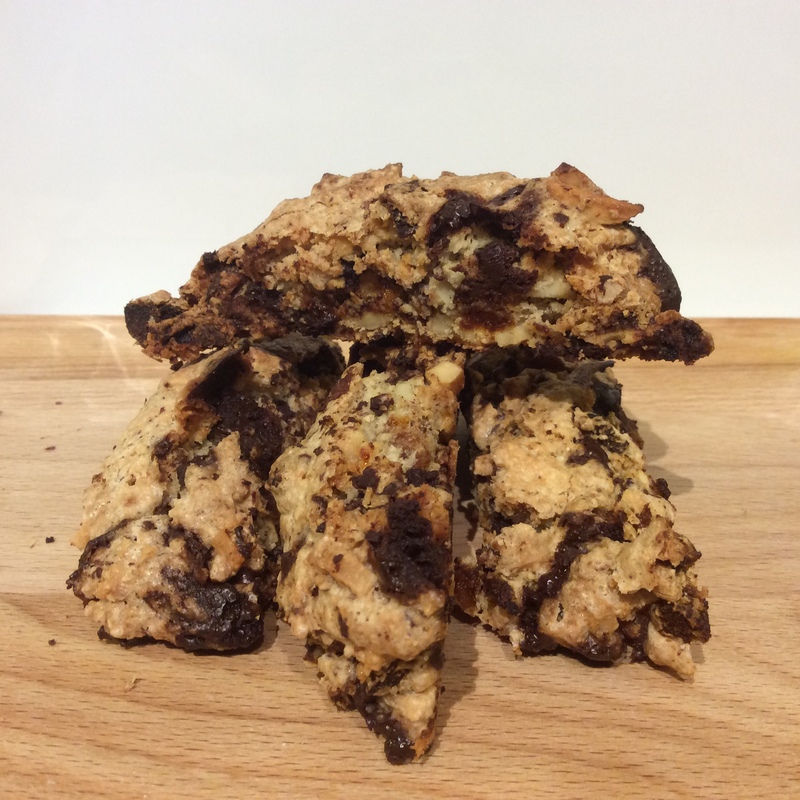 Unlike most biscuits Biscotti doesn’t contain any butter or margarine what it does contain is lots of sugar which adds to the crunch. The first bake is done in whole form till the outside of the biscotti is starting to set. The biscotti is then sliced into 1 inch, 2.5 cm wide slices and then returned to the oven so that the whole biscuit crisps up. 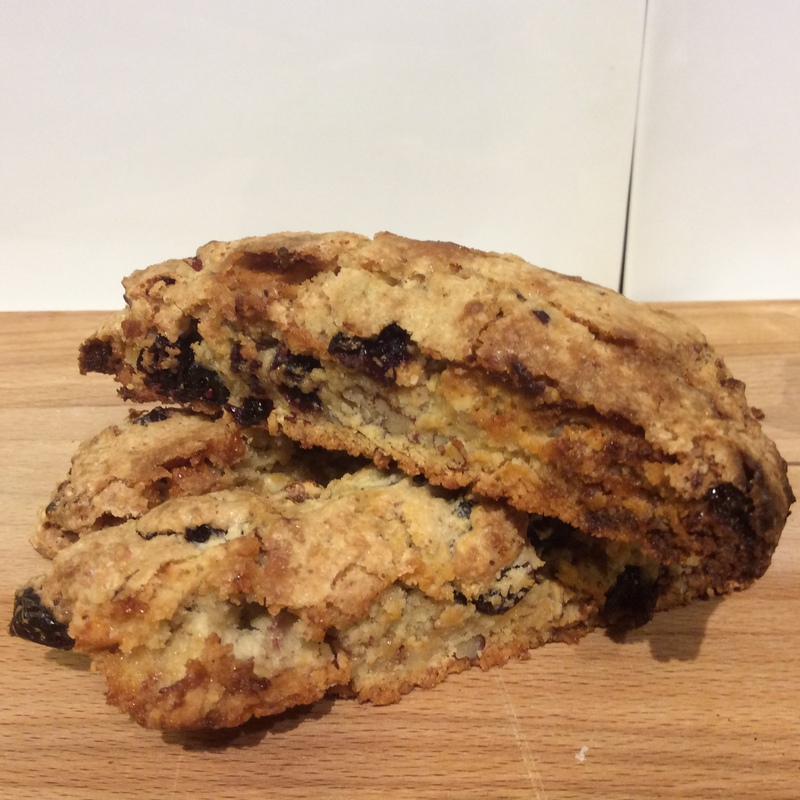 The twice baking means you get a crunchy biscuit which is great with a cup of tea or coffee. You can make your own variations to the special toppings. 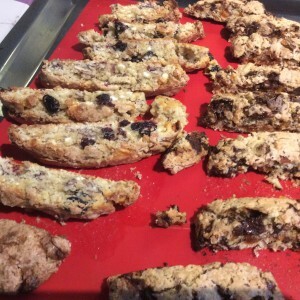 Originally the biscotti would have contained un-blanched almonds. 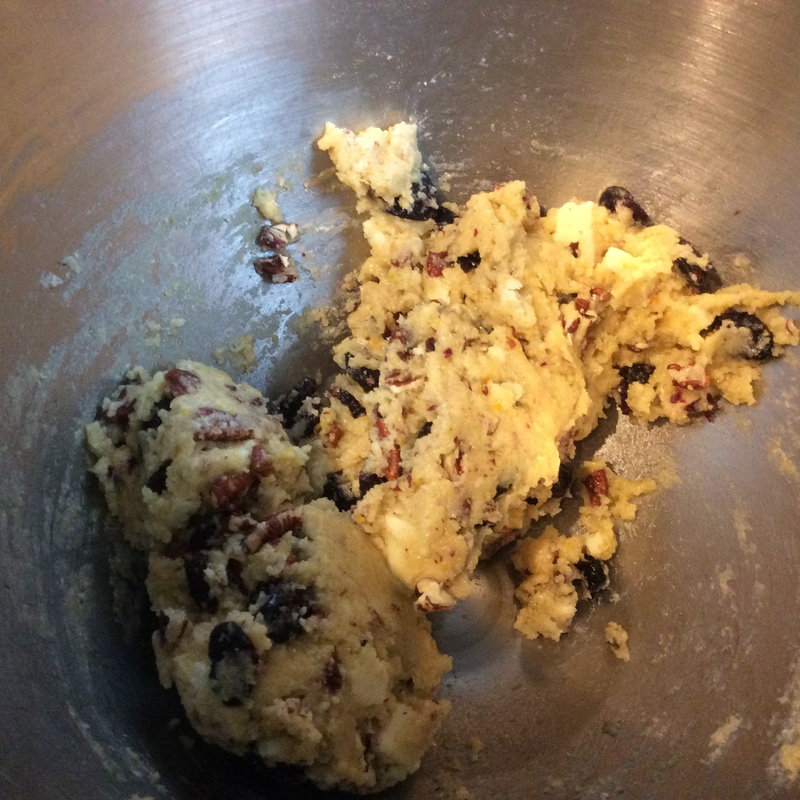 I have tried recipes with pistachios, hazelnuts and pecan nuts which have all tasted good. 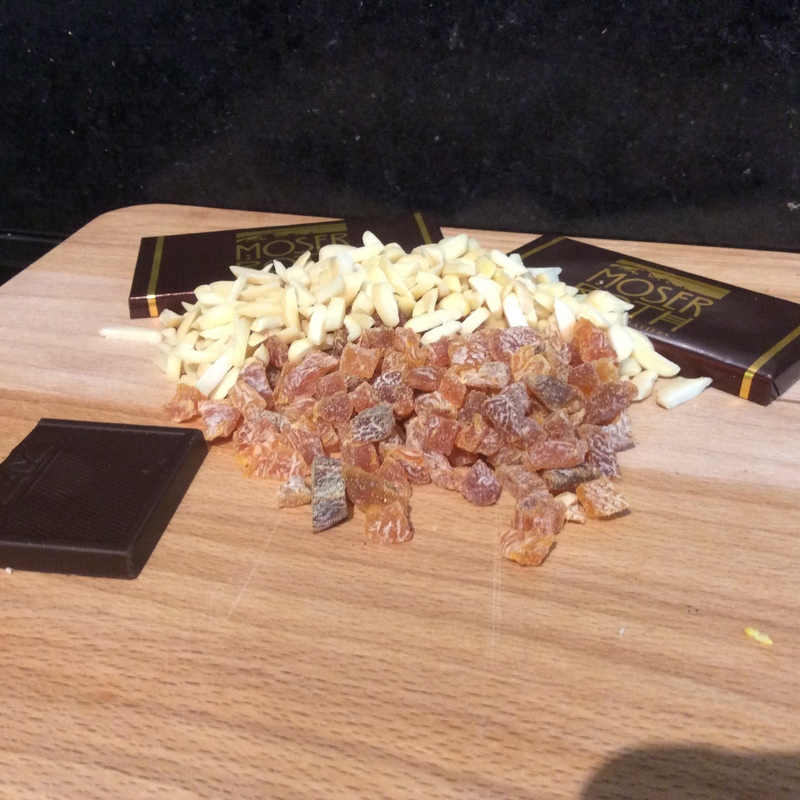 To make it a bit naughtier I add some chocolate and some dried fruit. Two suggestions for extra fillings are shown below. 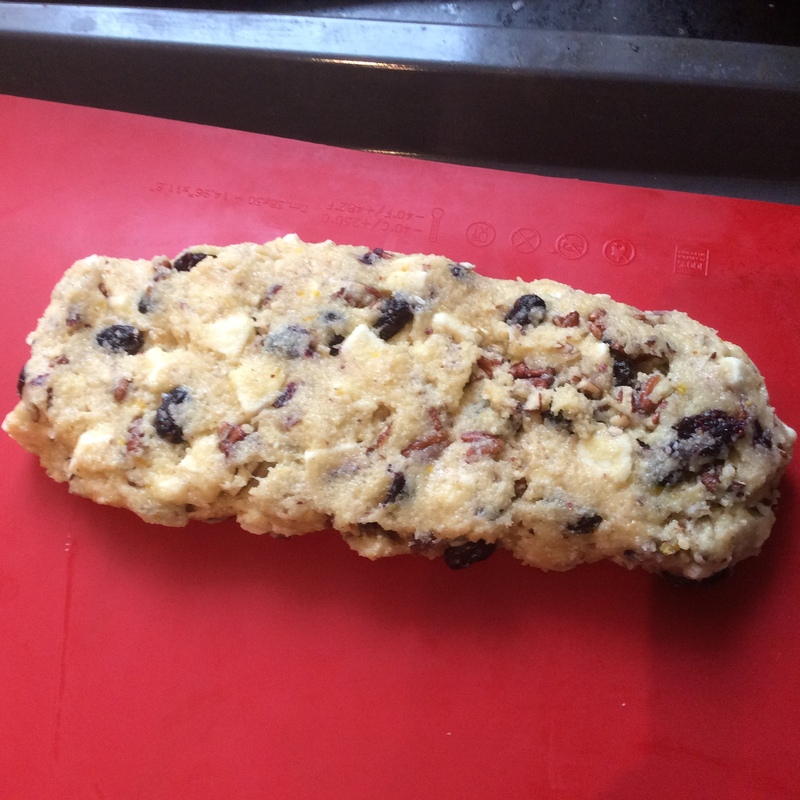 My current favourite is the Cranberry, pecan and white chocolate biscotti. These make great Christmas presents, I had to make two batches last time as the first batch didn’t make its way out of the kitchen. Let me know if you come up with some good combinations of your own.